"There is something about the outside of a horse that is good for the inside of a man," Winston Churchill once said. We think he was right. 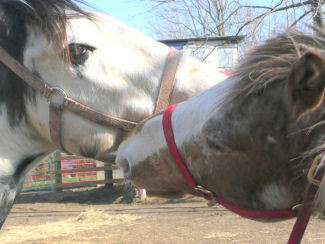 Much of life at Hillesum Farm revolves around horses. 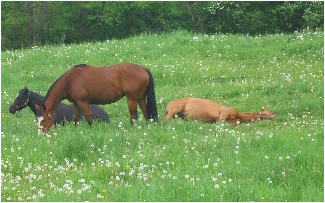 We breed horses, we have some long-time boarders enjoying the spacious paddocks and lush grass, and we always try to make room for horses that need temporary or permanent refuge. If you would like to save an unwanted or older horse from being sent to the slaughter house, think about being a sponsor and please get in touch; we will gladly try to find room for one more. No horse will ever leave this place to be "sold by the pound." 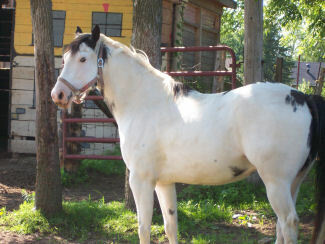 Sundance--who has no doubt as to how pretty he is. 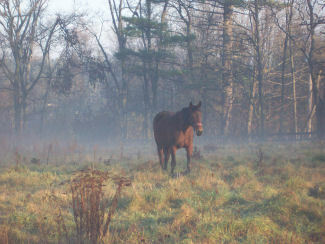 Aysha, a standardbred and mother of Zorro, one early fall morning. Sundance and his buddy Flek playing halter-tag. 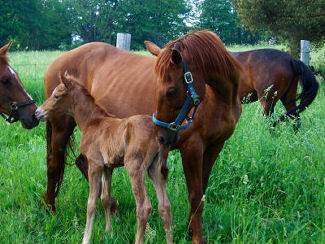 Hopi (="The Peaceful One"), just a few hours old, with Mom Sally in June 2005. Spring, and the horses enjoying the newly lush grass. 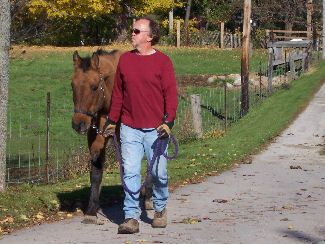 Sukkah, an older mare bought at auction, probably saved from a trip to the abattoir, being "taken for a walk" to introduce her to her new home. The gentlest and sweetest of horses, Sukkah has the coat of a teddy bear and the voice of a donkey, and steals everyone's heart. 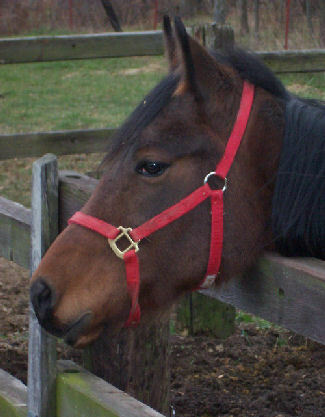 Zorro, a standard-bredsired by Donerail Express, as a weanling. He had a misshapen hoof when he came to Hillesum Farm. The farrier did a great job in correcting the problem. Zorro is the gentlest of spirits. If you love horses and want to sponsor a horse or support our aim of creating a sanctuary for unwanted animals, please ; we'd enjoy hearing from you.